This exquisite and rich-tasting organic olive pate is delicious on freshly baked bread or toast. It also adds an extra dimension to pasta dishes. 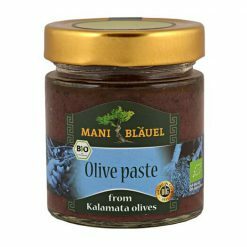 Artisan producers Mani-Blduel offer the highest quality olives and olive oil from the Mani area, on Greeceûûs Peloponnese Peninsula. The rocky, mineral-rich soil and sunny, dry climate provide the ideal growing conditions for the indigenous olive variety, Koroneiki. The noble olive tree and its fruit played a significant role in the Blduel familyûûs decision to settle in the area in the 1970s. In co-operation with local farmers, Fritz and Nurgi Blduel created a mild, fruity version of the regionûûs Koroneiki olive oil, which has gained appreciation by consumers and experts alike. Mani Blduel supports the preservation of the physical and cultural landscape of Mani, helping in its establishment as the centre of GreeceEEs organic olive cultivation. All products are produced in close cooperation with organic farmers, who Mani BlÃ¤uel has supported for many years. The company has received a Fair Trade Certification from organic food labelling non-profit organisation Naturland. As part of this certification, “i BlÃ¤uel follows seven principles: social responsibility, reliable trade relations, fair prices, regional supply of raw materials, collaborative quality assurance, community involvement and corporate strategy and transparency.